Mixes all your favorite juice ingredients. How is the Omega VRT400HD Different from the VRT350HD? 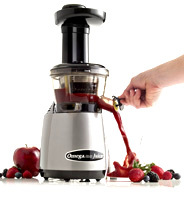 New - Omega VRT400HDS features a JUICER TAP. New - Improved Automatic Cleaning during juicing and during clean-up. During the juicing process, the AUTO-CLEANING system keeps the screen clear, increasing the machines efficiency. During clean-up the AUTO-CLEANING system minimizes the clean-up process. Simply close the juice tap, fill the bowl with water. The auto cleaning spinning brush cleans the juicer bowl. Then you simply open the tap and release. Continue this process until the water in the bowl is clear. New - Longer Warranty - This durable, high quality Omega 400HDS juicer features a 15 Year warranty. Small Footprint - Like the all the Omega VRT series, the VRT400HD provides all the benefits of a masticating dual-stage single auger juicer but in much less space. Patented, stone mill-like screw, made of GEs ULTEM material, which is 8 times stronger than augers on most other single auger juicers. Silicone Wiping Blade- The Omega VRT 400HD automatically clears excess pulp from the juicing screen as it juices. Benefits: higher yield and easier screen cleaning. Low Speed Technology System (LSTS) - World's first patented juicer utilizing the LSTS method. It is a complete departure from the standard masticating method. The LSTS method allows the Omega Juicer to extract the maximum amount of nutrients, vitamins, taste and juice from a minimum amount of fruits, vegetables, leafy greens, wheatgrass and even soybeans. Juice is extracted by an auger system at Low RPM. Pulp is further squeezed for maximum yield and extremely dry pulp. Soybeans - presses soybeans to make soymilk. Economical - Get the greatest amount of juice from the least amount of fruits. Peels and skins can be also used in various pastries, jams, soups, etc. Better Juice - Enjoy more antioxidants, better flavor and superior freshness of your juice. No frothing or foaming, and none of the separation that occurs with other juicers. The *NEW* Omega Vert, Model VRT400HDS Juicer, low speed squeezing juicer system, slowly squeezes fresh juice from fruits, vegetables and leafy greens. This masticating low speed system processes at 80 RPM preventing oxidation. Nutrients are preserved and maintained for up to 72 hours without degradation. Motor: 2 Horsepower condensor motor. ** Free Shipping applies to orders shipped to areas within the continental U.S. Please call for shipping costs to Alaska, Hawaii and overseas locations.